Now you can share your content with style. 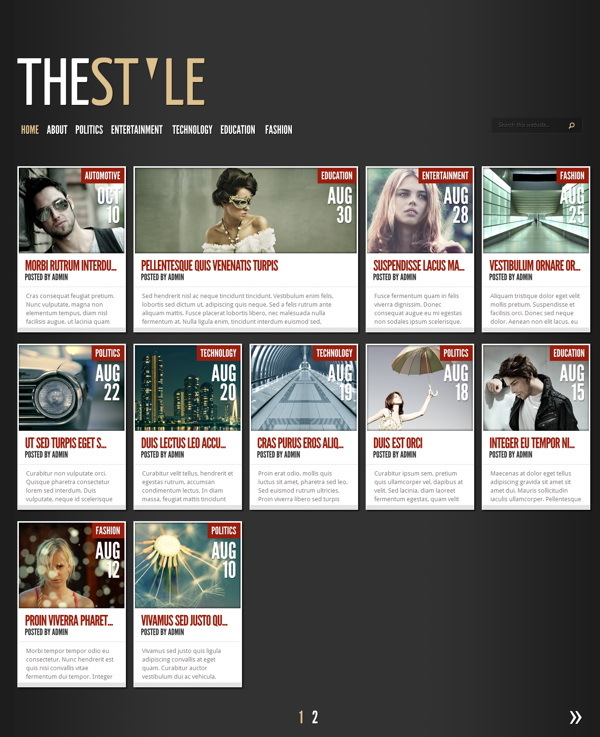 Featuring a crisp, modern design, TheStyle will give your blog that unique visual impact you have been looking for. With its unique jQuery-enhanced fluid width design, your posts always get displayed in a way that is best suited for your visitor’s resolution. TheStyle comes with five different color variations. If Black isn’t your style, then try out the Red, Brown, Turquoise or Grey color schemes. If you would rather not use the abbreviated post structure you can opt for the optional blog-style layout. When enabled, your posts will be displayed in full like a traditional blog. This theme utilizes timthumb to automatically resize your thumbnail images. Because of this, only one thumbnail images is required per post, despite the various thumbnail sizes used in the theme. With TheStyle you can place 125×125 banner images in your sidebar and 468×60 ads to your post pages with ease. Advertisements are handled from within wp-admin, and can be turned on and off at any time.